Home / Blog / Uncategorized / Tune-In To Hear Me On Veteran’s Day! by nancibesserreedLeave a Comment on Tune-In To Hear Me On Veteran’s Day! November 11, 2014: Is Your Radio Dial Stuck On WiiFM? Is your radio dial stuck on WiiFM, the What’s In It For Me Channel? 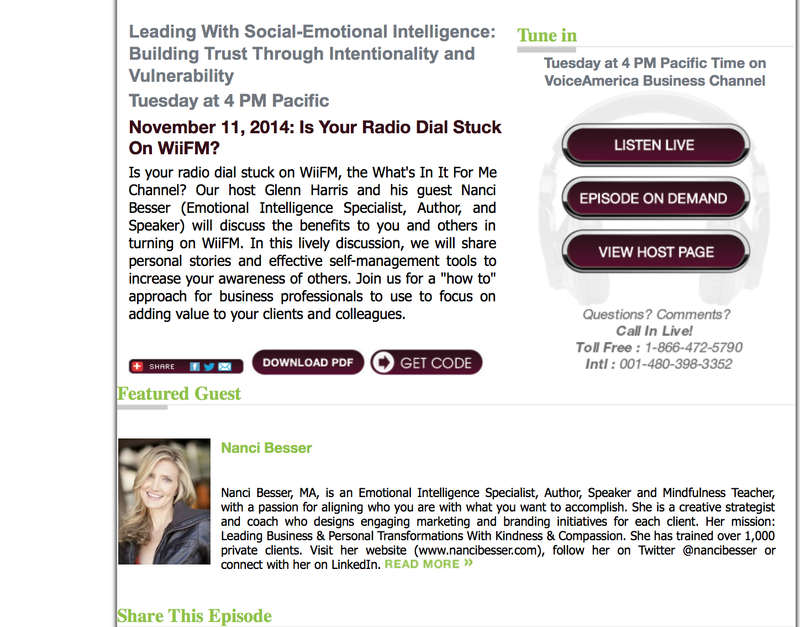 Our host Glenn Harris and his guest Nanci Besser (Emotional Intelligence Specialist, Author, and Speaker) will discuss the benefits to you and others in turning on WiiFM. In this lively discussion, we will share personal stories and effective self-management tools to increase your awareness of others. Join us for a “how to” approach for business professionals to use to focus on adding value to your clients and colleagues. Previous ArticleIs Empathy The Best-Kept Secret To Successful Management? Is Empathy The Best-Kept Secret To Successful Management?